Premiere's newest IMAX at Temple Mall wowed over 3,000 eager audience members who showed up to experience the celebration. "Absolutely amazing," said one guest leaving the screening. Said her companion, "I've never seen anything like it before, I feel like I'm floating on air right now!" Behind the "oohs" and "ahhs", occasional gasps, and racing heartbeats, lies a technological marvel that took hundreds of people over eight months to achieve, resulting in a movie experience of unparallelled proportions, authentic full-scale IMAX. Indeed, IMAX has become among the most preferred ways to enjoy motion picture entertainment in recent years. Movies shown in IMAX format have been painstakingly digitally-enhanced at the studio, making the image sharper, the color more vibrant and the audio more immersive. The technical specifications for creating the IMAX environment are based on discerning geometry, and nothing is taken for granted in the IMAX presentation. "See these microphones and cameras in the auditorium?" said Cindy Palmer, Director of Operations at the new IMAX which looms high above Temple Mall. "These are situated throughout the auditorium and the auditorium is fully-calibrated for optimal performance every morning in a 75-minute routine and monitored by technicians in Toronto. This process ensures all functions are maximized to ensure picture-perfect presentation before the first audience member arrives at IMAX. There's no other theatre or theatre company that does this." The IMAX also features two projectors instead of one, each putting out 6,500 watts of light, which effectively doubles the brightness on the screen from other Brand-X large format attempts. "This is one reason IMAX 3D is much more realistic than many types of 3D systems out there," added Ms. Palmer. The real amazement starts when the movie hits the 72' wide curved screen, and the sound penetrates every square inch of the auditorium. "You just know you're seeing the movie in a special place." The Temple IMAX was a feat of engineering, converting two of Premiere's existing largest auditoriums into a single IMAX auditorium, doubling the building height. The facility measures a whopping 90' long x 80' wide x 45' high, and houses one of the largest indoor movie screens in the state. The project was brought to Temple by Premiere CEO Gary Moore, who worked with City and Mall officials. "We believed Temple represented the perfect crossroads market in Central Texas for a destination attraction as significant as IMAX," he said when welcoming audiences to the grand opening. "People routinely drive 30 miles or more just to see a movie in IMAX." 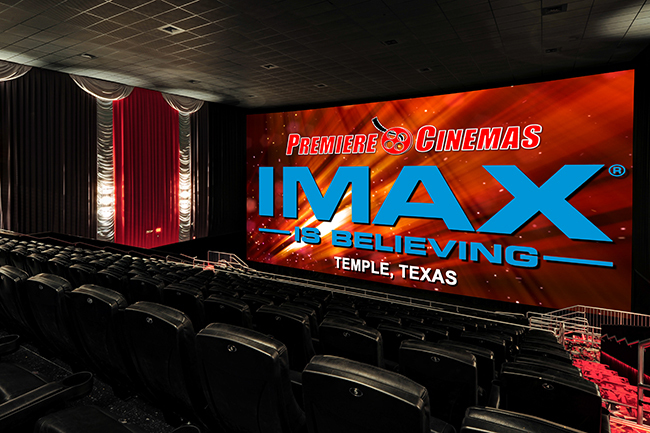 The Temple facililty is the only IMAX theatre between Austin, Dallas and San Antonio, and is expected to serve the Temple, Waco, Killeen, Harker Heights, Belton and Copperas Cove markets as well as other nearby counties. The Temple IMAX opened with "Space Station 3D", then showed "Hercules" for one week, and starts Disney/Marvel's eagerly-anticipated "Guardians of the Galaxy" tonight. Upcoming features including IMAX's new documentary "Island of Lemurs" and a 20th anniversary release of "Forrest Gump" on September 5th, in which the movie has been remastered and will be featured exclusively in approximately 300 IMAX theatres across the country. The newest installment of "Hunger Games" opens in November.